The Russian Richard Armitage Board Armitage-Online.ucoz.ru has wonderful calendar image creations about King Richard III on their website, created by diverse fans of Richard Armitage. Take a look at the brilliant creations. 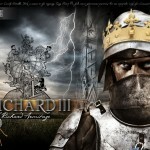 “Richard III: Leicester’s Search for a King”; Leicester Museum opens exhibit February 8, 2013.